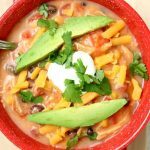 Slow Cooker Creamy Tortilla Soup is a dump and go crockpot recipe that tastes amazing! We love topping ours with avocado, tortilla chips, cheese and sour cream. This soup is a perfect dinner to make. It takes only a few minutes to get it in the slow cooker. 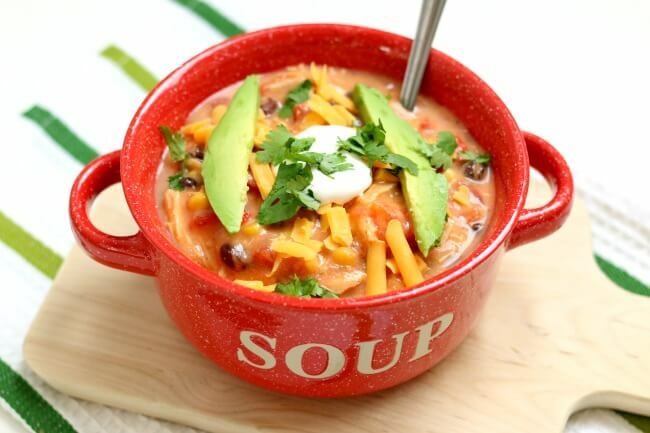 This is one of my very favorite soups to make. The reason? Most of the time I have all the ingredients at my house. You can use frozen chicken. 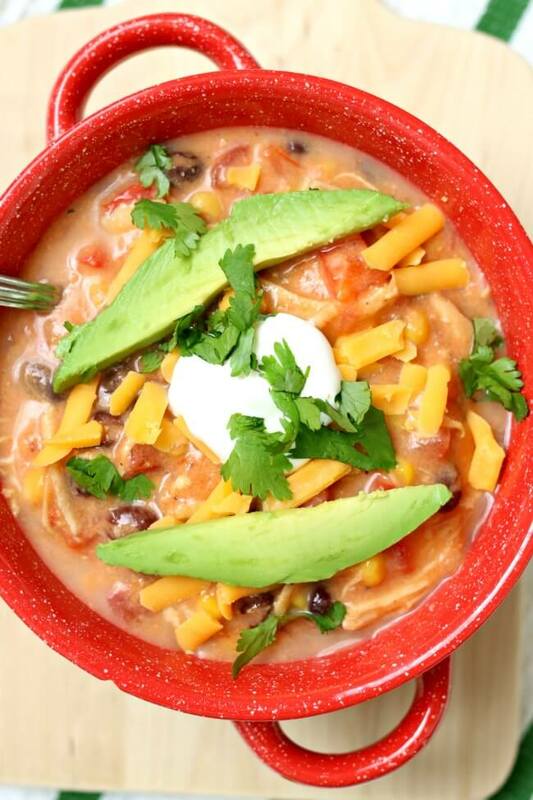 To make Slow Cooker Creamy Tortilla Soup I used my 6 quart oval Kitchenaid slow cooker. * I love this slow cooker. It cooks low and evenly. I love the medium heat choice because most slow cookers that I’ve seen only have the option of cooking on low or high. If you’re going to buy just one slow cooker, this is the one that I recommend. Place chicken, broth, salsa, tomatoes, lime juice, garlic, cream of chicken soup, red pepper, cumin, corn and beans in slow cooker. Cover and cook on LOW for 6-8 hours or on HIGH for 3-4 hours. Remove chicken and shred or cut into bite size pieces. Add the chicken back in to the slow cooker and then add cilantro and salt and pepper to taste. Ladle into individual serving bowls and top with desired toppings. 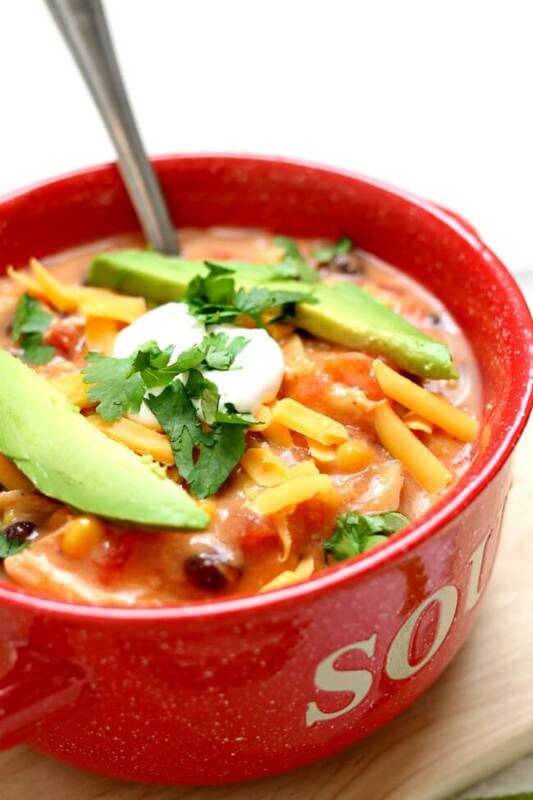 Like this recipe for Slow Cooker Creamy Tortilla Soup? Get all my new recipes delivered to your email inbox by signing up below. This looks delicious! If I wanted to use my instant pot, what would the settings be? Wow!! This sounds amazing just like so many of your other recipes!! I do have almost all of these items all the time, except for cilantro. Yes! and the cilantro is totally optional so make it tonight!!! This sounds amazing. Can't wait to give it a try! For Anne who wanted to find a sub. for the cream of chicken. I purchase the brand Pacific natural foods. The cream of… soups come in a box, so no BPA, and are organic. The ingredients are real. You can find them at a Sunflower market if you don't see it at your regular store. Or maybe a Whole Foods, Trader Joe's, Sprouts. Michelle, I agree with you. The cilantro makes it! I love this recipe because it is soooo easy and soooo good. Holy moly this was delish! I used a 4-oz. can of diced green chilis and the soup was so yummy. The cilantro makes it! Any substituion recommendations for the cream of chicken soup? Trying to eat more organic and less processed foods (ok with canned vegetables). Otherwise, sounds yummy – I love soup from the crock pot!